As Vergelegen Wine Estate charge an entry fee to all visitors, we have not eaten at any of the restaurants for over 10 years. This entry fee is fully justified for people wishing to visit the estate and explore the heritage, but personally I feel it should be refunded if you dine at one of the restaurants. However, friends chose where we were going to eat and I decided to overlook this snagging issue and make the most of our dinner. We went to Camphors on the same evening that Somerset West experienced flash floods and I am not sure whether the gate was not manned due to the rain, or if this is common during the evening. Wines from the estate are available and the wine list is extremely descriptive, including the composition of each wine on offer. Wines are available per glass (250mls) or per bottle. These Bordeaux style wines are priced the same as if you bought them at the cellar door which is remarkable. 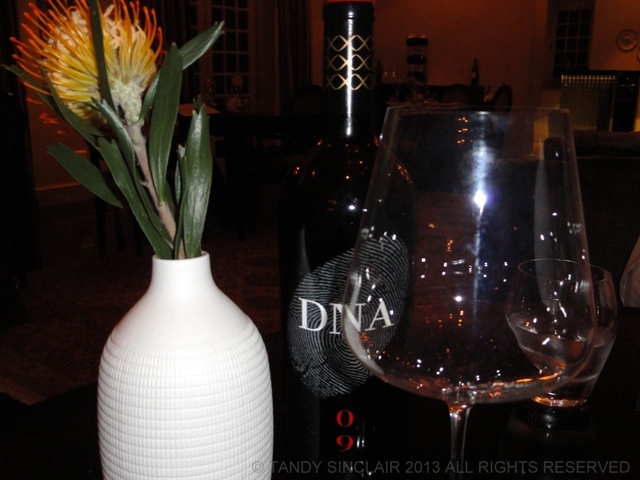 Dave and I chose the 2009 DNA (R185) and our friend chose the GVB White 2010 (R310). The wine is served in 100% pure glass wine glasses which are so thin that they are flexible. Our wine had a lovely finish and was heady on the nose, with a cassis taste and a lovely soft palate and great legs. I peeked into the bar and there was a great selection of single malts on offer. I like the fact that the menu does not offer too wide a variety of choices. There are 5 starters, 5 main courses and 4 desserts. Much to my dismay there was no crème brûlée on the dessert menu as this is the dessert I choose to make a proper comparison between all the restaurants we eat at. We were served a platter of amuse bouches and a bowl of pigs tails which were really good and which Dave thought were better than the ones we had at The Pot Luck Club. There were cod fritters which reminded me of Jewish family dinners and a cheese puff which was quite average tasting. 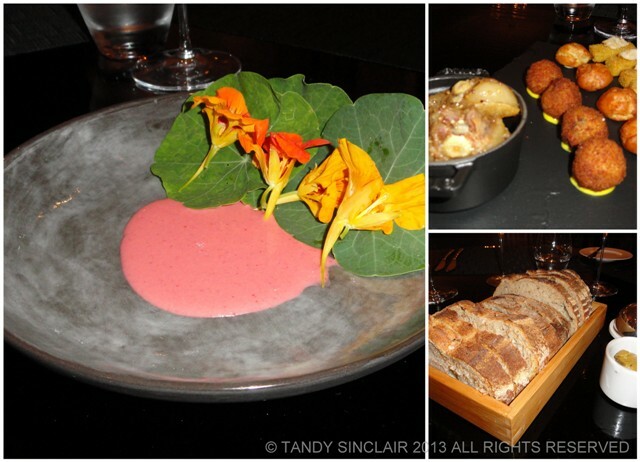 The chickpea cakelet was very nice and the nasturtiums with strawberry sauce was definitely something different. We were also served three different types of bread with butter and baba ghannoush on the side. I loved the baba ghannoush as it tasted like it was made with roasted garlic. It was smooth and had a great depth of flavour. The bread is made off site in Woodstock and I sampled half a slice of the olive ciabatta, the potato bread and the sourdough and my favourite was the olive ciabatta. I chose the seared Lourensford trout and trout tartar as my starter. This was served with horseradish that was not very evident, as well as avocado, cucumber and soy caviar. The cucumber was extremely tasty and I loved the caviar. 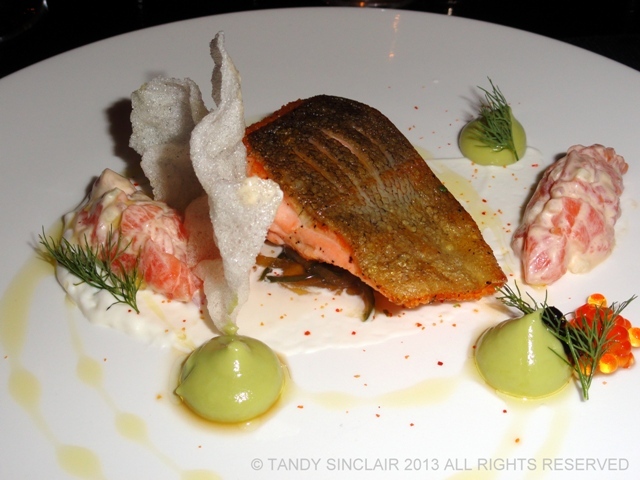 The tartar was divine and the trout just seared with a crispy skin. For my main course I had the hay smoked duck breast and duck ham which was served with parsnip purée, pickled beets and shitake mushrooms. I chose to have the duck cooked as the chef recommended, which was medium, and it was perfectly done and very succulent. 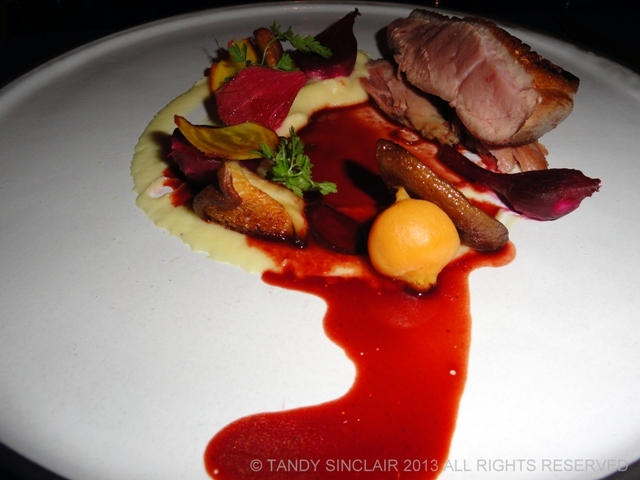 Unfortunately my main course was cold and this distracted from the tasty duck and crispy skin. Upon asking, the entire table was served cold food on cold plates. We were served a predessert of guava cheesecake that was extremely fragrant and really delicious. 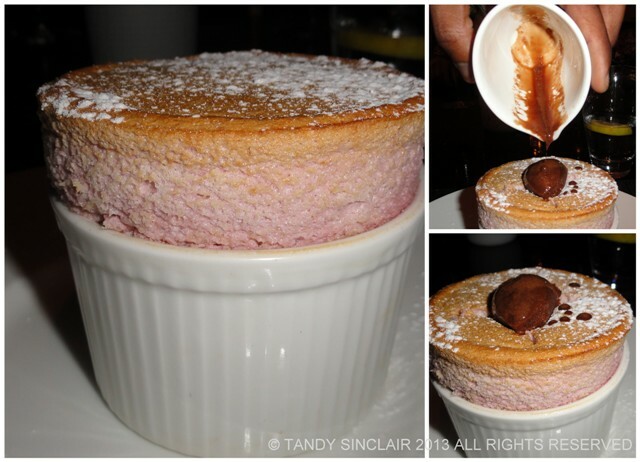 I had the raspberry soufflé for dessert as this is also a great indication of a good dessert. The soufflé itself was perfect but way too sweet, with each bite getting sweeter and sweeter. The 49% Felchin chocolate and Earl Grey blue flower sorbet was smooth but the tea flavour too overpowering and the taste lingered in my mouth for over an hour. 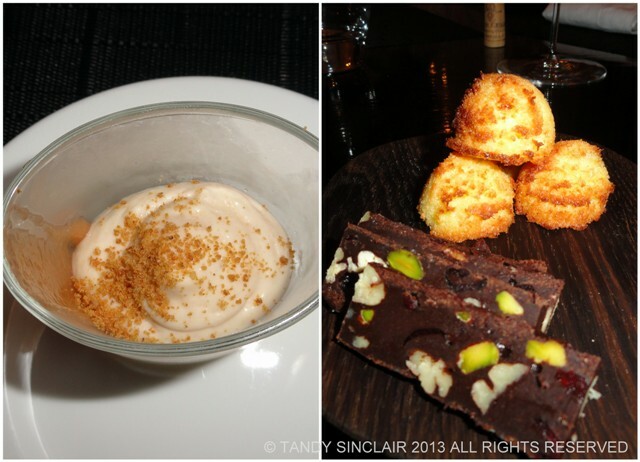 After our meal we were served bon bons of a coconut cake and a divine chocolate and pistachio paneforte. The service was excellent, and this aspect separates Camphors from other restaurants in the area. Christo, the sommelier, was able to answer all the questions we had about the wine. When opening the wine, Christo presented the cork for me to smell. Our waiter knew the menu and could make recommendations. Tonny was well spoken and well presented and did not intrude once on our meal. The restaurant is wonderfully appointed with large booth tables which are set back from the walls, allowing the service to take place without anyone stretching over the table. 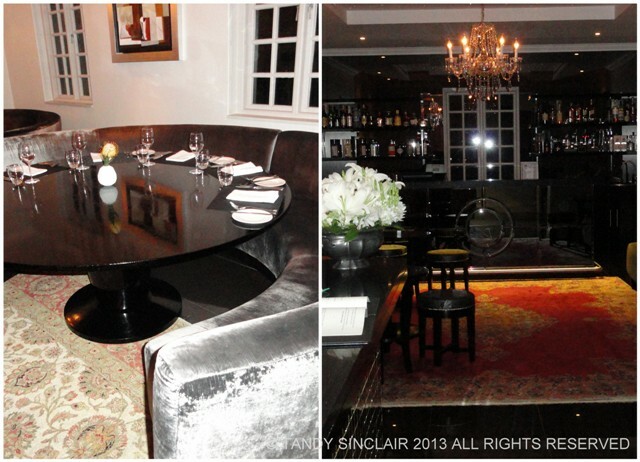 Make sure you ask for a booth if you book as the ordinary tables are really quite small. There is a reception area where you can leave your jackets and umbrellas and a separate bar that looked quite comfortable and inviting. The night we went, the outside lighting was not working which meant navigating the path back to the car in the dark and having to avoid the two ponds. And … be sure to book and be prepared to pay a bit more than you normally would expect to. The entrance fee is R10 per person. I ate there a couple of months ago and enjoyed it too although it is pricey. We went back recently for a picnic and unfortunately that was terrible! A beautiful, beautiful vineyard though. One of my favourites. In my early childhood we would picnic there and be part of the faux fox hunts. I wonder if they still do those? What a shame, I would have been very disappointed. Paying to visit and then cold food!! Looks like a great dinner, everything looks so rich and decadent! I love places with beautiful food. I haven’t been there for years, but as you are the second person to mention it to me in a matter of weeks, I think I need to go back. Cold food?! That’s not cool!! My worst is cold plates! Looks like a fantastic dinner! I’m salivating just looking at the photos. YUM!